It’s inevitable that any air conditioner is going to need to be replaced at some point. Here in Arizona, air conditioners typically last between 10 and 15 years. A unit that is well-maintained might keep going strong for up to 20 years, but that’s pretty rare in places like Phoenix, where high temperatures require constant use during the summer months. If your air conditioner has been acting up, but you aren’t quite sure if it needs to be replaced, there are a few tell-tale signs to keep an eye out for. Once your AC hits 10 years old and needs a major repair, it’s pretty safe to say those repairs are going to start coming around much more frequently. Not only are units of this age far less efficient than newer ones, it may also be more difficult and expensive to find parts. Instead of letting repair costs pile up, you’ll do better to replace your air conditioner with a nice new reliable and efficient unit. Does it seem like your air conditioner just doesn’t cool your home like it used to, or has to run longer to hit a comfortable temperature? As units get older the parts start to wear out and don’t work as efficiently. Once parts start wearing out it will take longer and longer to cool your home, using more energy in the process. Expect this to continue until your unit breaks down completely. Are you seeing a noticeable increase in your energy bill every summer? 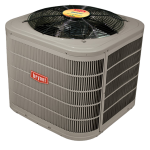 If it seems like it is getting more expensive to run your air conditioner during high use periods, it could be a sign that your AC unit is on the way out. If parts are worn out and it has to work harder just to cool your home, you’ll see that on your energy bill. If your unit still takes R-22 refrigerant to cool your home, it is outdated and you should consider replacement. This type of refrigerant isn’t allowed to be used in new models anymore, but certified technicians can still get it. The problem is that it is becoming harder to get ahold of the old R-22 refrigerant and more expensive. Today’s models use a more environmentally-friendly and less expensive refrigerant called R-401A. If you need major repairs after your warranty has expired, it may be time to start looking into a new unit. Having to pay cash for major repairs could end up costing you more over the long term when it might just be more cost effective to invest in a new air conditioner. If you are on the fence about whether to repair or replace your air conditioner, feel free to get in touch with the experts and schedule a consultation. Our certified and experienced technicians at Precision Air are ready to help you 24 hours a day. Just call 602.Fix.MyAv (602-910-2758). 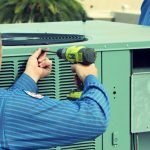 Are A/C Maintenance Agreements Worth It?